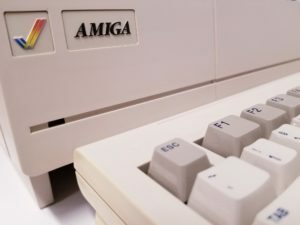 Showcased to the world in a grand unveiling by Commodore in 1985, The Commodore Amiga (as it was known at the time) was truly a ground breaking machine. It had full colour graphics, capable of displaying 4096 colours at once (using the Amigas HAM display mode), when the Apple Macintosh that had been released the year before was still black and white. It had stereo sound, when most other machines had, at best, mono sound output. 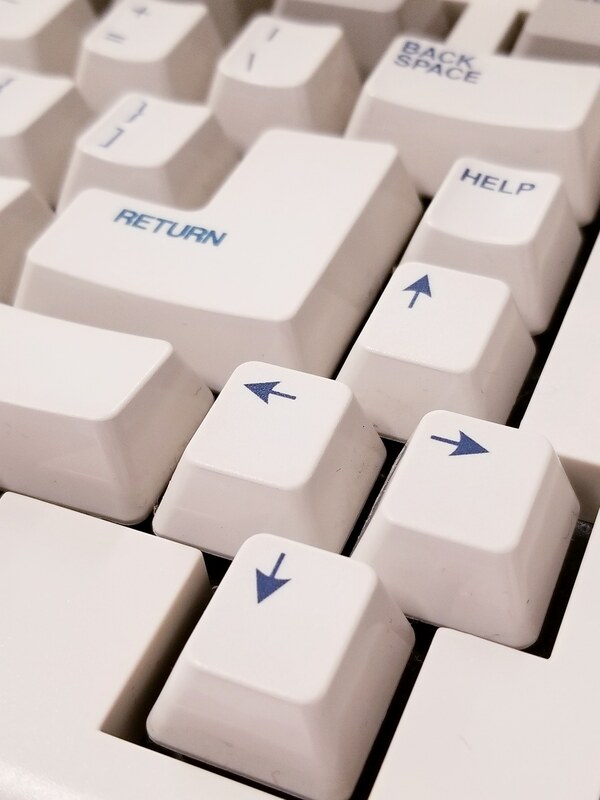 It had a multi-tasking operating system, while other machines could only do one thing at a time. It is difficult to explain to people just how revolutionary this machine was when it was released to the world, and indeed, Commodore struggled to know how to advertise this machine. This being the first model, the custom chips that were the beating heart of the machine became known as the OCS (Original Chip Set). Because of the rush to get the new Amiga out to the public, the core of the Amigas operating system – Kickstart – was included on a 3.5″ floppy disk that had to be inserted each time the machine was turned on. It would then load the Kickstart into a special area of memory, disable writing to that memory location, and then restart itself. At this point it was ready to load software, such as the Amiga Workbench, a game, or whatever other software you wished to use. This somewhat cumbersome method enabled newer versions of Kickstart to be easily distributed and meant that the software wizards could continue to work on Kickstart, adding new features and fixing issues that they found, while end users didn’t have to open the machine to use a new version, they could simply use the newer Kickstart disk. There were (and still are) ways of combining the Kickstart and Workbench disk contents, so that no disk swapping was required in order to load Workbench, as Kickstart took up 256KB (thus leaving 624KB free on an Amiga 880KB double density floppy disk), and early revisions of Workbench 1 were relatively small too, meaning both Kickstart and Workbench could comfortably fit on the same disk. Very early production models of the Amiga came with an early revision of the DENISE display chip, which was unable to display the Amigas special 64 colour EHB mode, which had 32 colours that could be chosen from the 4096 colour palette, but then had copies of those 32 colours that were half as bright. The Amiga 1000 was extraordinary with regards to it’s audio and video output. Not only could it output in true stereo, using 2 standard RCA sound outputs, but it also had several outputs for connecting various display devices such as a TV, composite monitor or RGB monitor. It had what became the standard Amiga 23-pin male D-dub RGB output, it also had a RCA composite video out, and an 8-pin DIN A/V output socket. As with most machines of the time, it also offered the standard parallel and serial ports for connecting printers, modems and various other devices. However unlike every other machine, these ports have the reverse genders, so the DB25 serial port was female instead of male, and the DB25 Parallel port was male instead of female. Because of this, it is VITAL that great care is used when connecting items to these connectors, as it is possible to damage the electronics if you connect something to the wrong port. 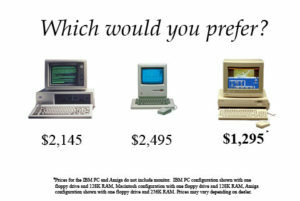 This was changed to be the same as all other machines with subsequent model Amigas. It also has a connector to connect up to 3 external floppy disk drives. The Amiga was not a closed system like the Apple Macintosh, with a socket for RAM expansion, as well as a general-purpose expansion edge connector located on the right side of the machine, which enabled adding expansions such as the A1060 IBM PC-XT emulator, extra RAM, a hard disk drive, and many other expansion options. This was the same edge connector as used on the later Amiga 500 and Amiga 500 plus, however as the Amiga 500 and 500 plus had it located on the left side of the machine, instead of the right. 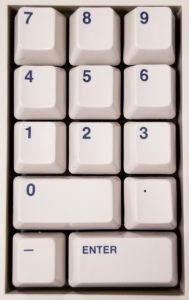 If you use an expansion designed for the Amiga 500 on an Amiga 1000, it will be rotated 180 degrees, so that what would normally be at the back is at the front, and vice-versa. Like the original Apple Macintosh, many of the team that designed the Amiga had their signatures inside of the Amiga 1000 case: Signatures of the Amiga team inside the Amiga case. Interestingly, there is one person whose signature appears within BOTH the original Apple Macintosh AND the Commodore Amiga 1000: Ronald H. Nicholson, Jr.